, late president of the United States of America, and a political writer of considerable reputation, was descended from one of the families who founded the colony of Massachusets, and was born at Braintree, in that colony, Oct. 19,1735. Before the revolution which separated | America from Great Britain, he had acquired much reputation in the profession of the law; and on the eve of that event, he published “An essay on canon and feudal Law.” He afterwards employed his pen in the American papers, and contributed essentially to widen the breach between the mother country and her colonies. He was still, however, a friend to loyal measures; and when captain Preston was tried for his life, for ordering the soldiers to fire upon a mob, pleaded his cause with spirit and eloquence, and Preston was acquitted. 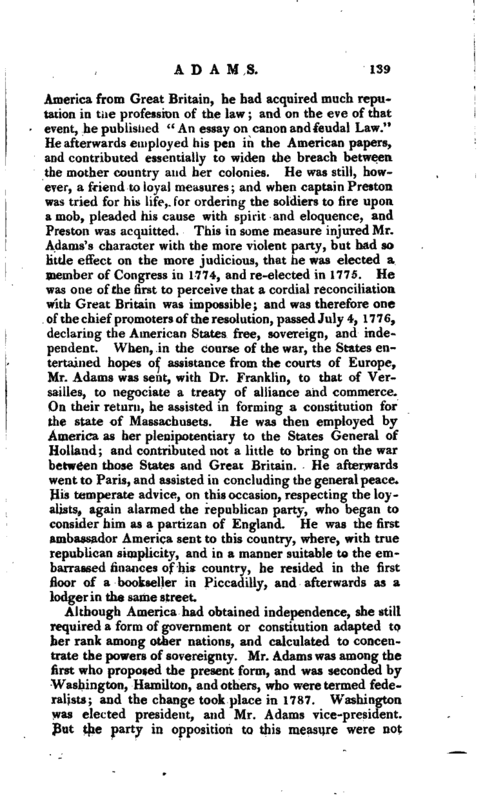 This in some measure injured Mr. Adams’s character with the more violent party, but had so little effect on the more judicious, that he was elected a member of Congress in 1774, and re-elected in 1775. He was one of the first to perceive that a cordial reconciliation, with Great Britain was impossible; and was therefore one of the chief promoters of the resolution, passed July 4, 1776, declaring the American States free, sovereign, and independent. When, in the course of the war, the States entertained hopes of assistance from the courts of Europe, Mr. Adams was sent, with Dr. Franklin, to that of Versailles, to negociate a treaty of alliance and commerce. On their return, he assisted in forming a constitution for the state of Massachusets. He was then employed by America as her plenipotentiary to the States General of Holland; and contributed not a little to bring on the war between those States and Great Britain. He afterwards went to Paris, and assisted in concluding the general peace. His temperate advice, On this occasion, respecting the loyalists, again alarmed the republican party, who began to consider him as a partizan of England. He was the first ambassador America sent to this country, where, with true republican simplicity, and in a manner suitable to the embarrassed finances of his country, he resided in the first floor of a bookseller in Piccadilly, and afterwards as a lodger in the same street. Although America had obtained independence, she still required a form of government or constitution adapted to her rank among other nations, and calculated to concentrate the powers of sovereignty. Mr. Adams was among the first who proposed the present form, and was seconded by Washington, Hamilton, and others, who were termed federalists; and the change took place in 1787. Washington was elected president, and Mr. Adams vice-president. But the party in opposition to this measure were not | silenced; and when the French revolution took place, they in general were found to attach themselves to the interests of France, in opposition to those of Great Britain. 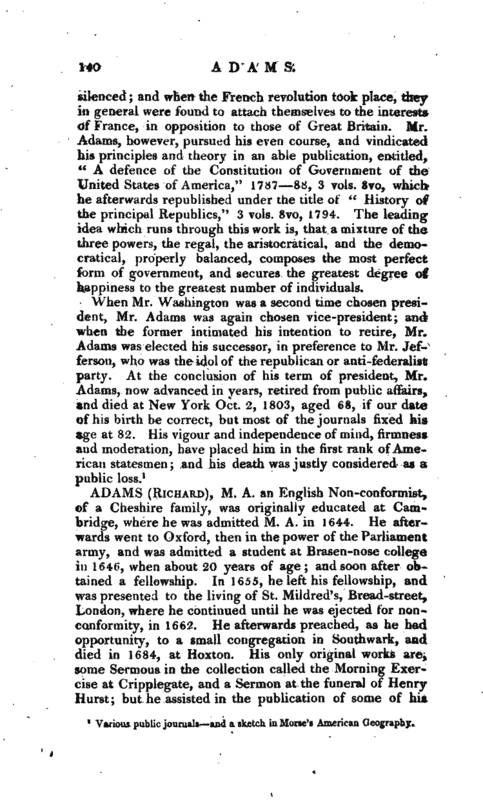 Mr. Adams, however, pursued his even course, and vindicated his principles and theory in an able publication, entitled, “A defence of the Constitution of Government of the United States of America,” 1787 88, 3 vols. 8vo, which he afterwards republished under the title of “History of the principal Republics,” 3 vols. 8vo, 1794. The leading idea which runs through this work is, that a mixture of the three powers, the regal, the aristocratical, and the democratical, properly balanced, composes the most perfect form of government, and secures the greatest degree of happiness to the greatest number of individuals. 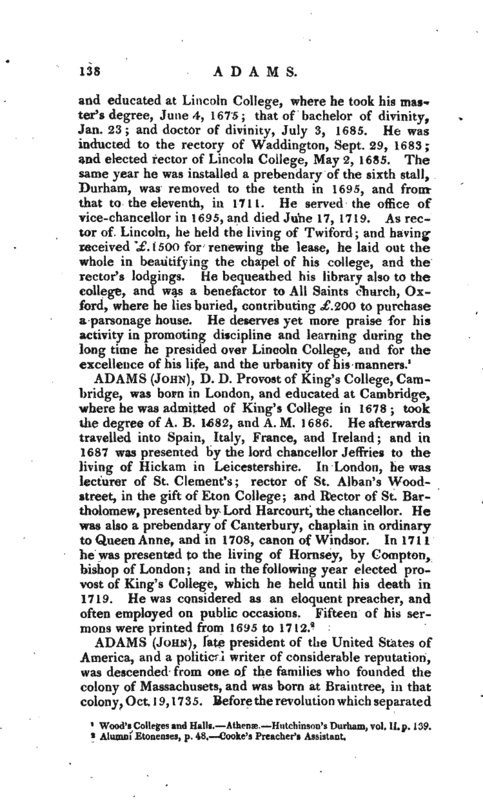 1 Various public journals and a sketch in Morse’s American Geography.